For all you guys wanting or wondering about how and what it takes to upgrade your 4L60E and 4L65E transmissions, this will give you an idea of what you will be getting into. Personally if you are mechanically inclined and have basic hand tools YOU CAN DO THIS. Transmissions can be intimidating due to all the small parts and the amount of parts internally. But if you do your research, read carefully, take your time, keep things organized, clean, and double check your work it can be accomplished. What is the point of a shift kit/servo upgrade? The best way to describe this (at least that I can describe) is to use the word "overlap". On a bone stock transmission, overlap is referring to the softness between upshifts (1-2, 2-3, 3-4) and also downshifts. For example, when you ride your brakes while driving the pads will fail and wear a lot sooner and generate heat right? Take that and convert it over to what happens in a transmission. When your transmission is shifting into a higher gear, the lower gear has not fully released all the way. So for the short time the transmission is in two gears at once they are essentially "slipping" as one or the other has not fully engaged. Hence the saying "overlap". This is also happens on a downshift as well. This generates heat and removes clutch and band lining at a greater rate. As well as glazing/polishing the clutches, steels, drums, band, ectWhen you install a "shift kit" and servo upgrade you are positively modifying the valve bodies ability to apply and/or direct fluid to the clutch or band apply circuit. This firms or quickens shifts by releasing and applying circuits more efficiently and reducing "overlap". Now for those who ask "will my transmission hold up by doing this for so and so mods / horsepower?" There is not answer to that. Again this is a process to help the longevity of the stock 60E due to the issues above. This will not correct breaking of input/output shafts, pinion failure, reaction sun shell breaking, ect. With all that happens inside a transmission its hard to tell whats gonna break first with all the variables for a failure. http://www.transmiss...r.net/4l60e.htm. You might have to hunt around a little on the site for the parts but you will find them. They should be in descending order through the web page. I will have the part number first, part name, and a little description as to what it is and why to use it. #2 – 4L60E Corvette 2nd Intermediate Servo : This is the servo that comes in high performance Corvettes and Camaros. It has a greater fluid apply surface area which in turn will apply or "grab" the 2-4 band more efficiently. Other options are the Superior and Sonnax 2nds. I have ran both the Corvette and Superior 2nd in different transmissions and in my opinion one isnt any better than the other as far as applying. They both felt the same. There is thought you will get a better 2-3 shift from the Superior and Sonnax, but for the money the Corvette is by far the best bang for the buck. #27 – 4L60E / 4L65E oversize .490" pressure boost valve and sleeve. The stock size is .470" and the larger diameter valve will yield a 10% to 15% higher line pressure. Instead of drilling the factory sleeve with the drill bit supplied in the shift kit, you will just replace factory ones with these. #37AP2 – 4L60E Billet Forward Accumulator. This piston goes in the valve body and cushions the shock when shifting from reverse to drive. Very common for the factory plastic piston to wear or crack. This will result in fluid loss, delayed engagement, slipping, burned clutches and/or band. This is a very cheap part and should most defiantly be replaced. You will replace a spring or springs in this bore so replace this! #37AP – 4L60E 3-4 factory accumulator piston. These are aluminum from the factory but have a tendency for the center hole to wear resulting in loss of pressure. Again, you will have this out so replace this! #37AP3 – 4L60E 1-2 factory accumulator piston. Same issue as above. Replace due to having out. #K4L60E-L – Superior Shift Kit fits 1998 and up. Self explanatory. As stated above, I am suggesting this kit due to the fact of the positive feedback I have had from it, and others as well. You will need to get this from your local GM Dealer. You will need a fluid filter and pan gasket kit. You can either get this from your GM dealer while you are there or your local O'Reilly, Napa, ect. For fluid brand, that is up to you. To be honest, O'Reilly ATF is perfectly fine and is what I use and many others as well. If you feel you need to have a brand name such as Valvoline go for it. Pick up a case, you will have extra but you can take the extra back or keep it for future instances. Always good to have ATF on the shelf. While you are at your local O'Reillys, pick up a bottle of Platinum Lube Guard transmission fluid friction modifier. What is this you say? In a nut shell, all ATF has some sort of friction modifier in them. They are chemical additives in the fluid that effect how the transmission feels when it shifts gears. Specs vary to one make or model to the other, hence the variety of ATF's out there. As miles add up, or "abuse" is given to the trans heat and consistent shearing of the internal parts break down ATF. When this happens one of the first things that goes is the friction modifiers in the fluid. When this happens shifts may become rough and jerky. Ever heard of someone saying when they changed transmission fluid and filter it shifts so much better? Wala. When filling your transmission up with new fluid, pour a bottle of this in with it. A few other odds and ends you should have when doing this. If you have access to Vaseline you will need a tiny bit to keep the checkballs in place during re installation. Also 3-4 cans of brake clean. I dont have many pictures with this but it should be self explanatory in its own. 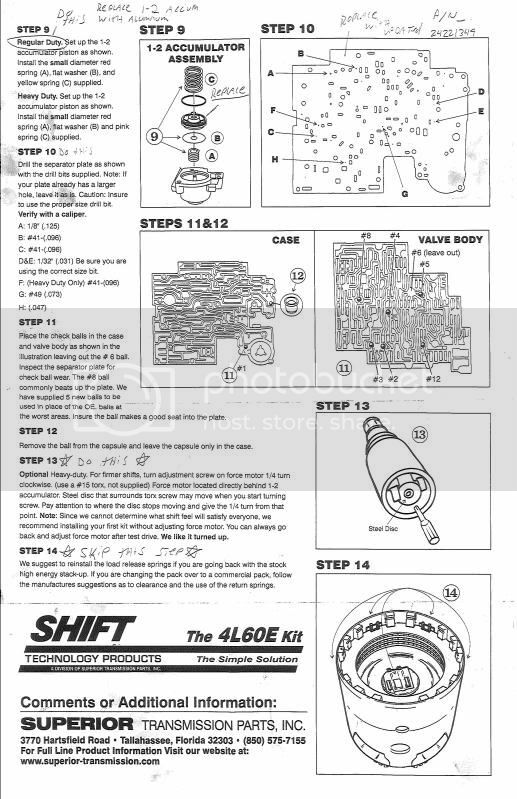 I have provided the instructions from the shift kit itself with a few notes on them to aid in the installation. You can install this upgrade in two different ways. One with the transmission in the truck or with the transmission out on the bench. Usually if its on the bench you are installing a converter as well. But this can be accomplished with the transmission still in the truck. A little tip if doing it in the truck. If you have the time, get the fluid drained the night before and let the excess drip overnight. This will be much easier than having trans fluid dripping down your arms or in your eyes. If you do this, be smart about it. You dont want to leave the transmission open to foreign elements such as excessive dust and debris. On the left side of the transmission you will find your shift linkage. You can take a flat screwdriver and pop the cable from the linkage rod. You will then see a cable bracket thats bolted to the trans case. Dont try to take this bracket off. There is a metal "U" clip that holds the cable in the bracket. Once you pry out the clip, depress the tabs on the cable and shimmy out the cable from the bracket. Set aside. Now you will see your fluid filter. To loosen kind of move side to side till you free it up a bit. Then gently remove. Next is to disconnect all electrical connections. There should be 6-7 connectors. Then last there is two bolts holding the TCC (torque converter clutch) solenoid in place. This is located at the front of the valve body, follow the wiring and you will find it. NOTE: Do not try to remove the entire harness from the case. There is a special way to get the connector out of the case and there is no need to do it. So just tie it up out of your way. Next should be your transmission fluid pressure manual valve position switch. Kind of looks like a circuit board by the rooster comb. Should be 5 bolts holding it on, 3 big and 2 small. REMEMBER WHERE THE BOLTS GO. When reinstalling if you get a big bolt in the smaller hole and go to torque, you will bottom out the bolt and snap it off in the case! Next is the fluid indicator stop bracket. This is located on the opposite side of the rooster comb in the front corner. Next is to loosen the valve body. Again it is crucial you remember what bolts go where as there are different size bolts for the valve body. There are three bolts with 8mm heads and the rest have 10mm heads. Before you remove all the bolts, you will see the 8mm bolts surround the 1-2 accumulator housing. Remember this when you are reassembling to grab your 8mm's and surround the 1-2 accum. There is one small 10mm bolt that goes between the 1-2 accumulator and fluid indicator stop bracket. The rest are explanitory. Once you loosen the VB, you will have to take off the link to the manual valve. (again by the rooster comb).Be careful when pulling down the VB as there are check balls that will come down with it that is between the VB and case. When reassembling, you can use vaseline and apply it where the checkballs go according to the shift kit instructions. This will help keep the checkballs in place while lifting the VB in place. Also the one checkball that goes in the case this will keep it up in there as well. You dont have to get crazy with the vaseline either, just a dab to keep everything from moving will do. Remove gaskets and spacer plate. Next is the servo assembly. There is a round snap ring that holds the assembly in the case. Doing this in the truck can be kind of tricky. 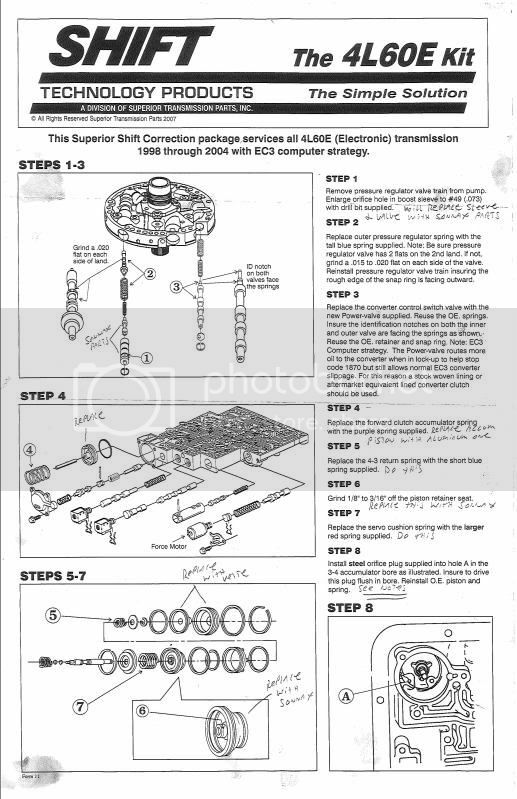 You will need to depress the servo into the transmission, then pry out the metal snap ring. Again, this could be difficult while in the truck. If you are doing this on the bench, secure the trans on the table, take the bottom end of a hammer handle or any type of handle and depress the servo in the case then pry out the snap ring. Once you get the snap ring out, there will be a black (if I remember right is factory and blue is aftermarket) o-ring for the servo cover. You will have this o-ring in your servo kit so you can pry some of the o-ring out then cut it. Remove and the servo assembly should pull right out. NOTE: keep the assembly in tact until you go to swap the 2nd and 4th apply servos later. That way you dont get confused on what goes where. NOTE: when performing step 8, make sure when you are installing the plug, not to install with something that will puncture through the plug. Use something that will cover the surface area of the plug and tap it in very slow. Make sure its in there too, you will know when it is seated. NOTE: after the servo installation, double and triple check your round snap ring that hold the asssembly in the case. It is common for guys to mis this and not have the ring fully seated in the case. Trust me, you dont want to have this happen! NOTE: if you have had your truck tuned by one of the tuners on the site (Wheatley, Blackbear, Zippy) or had someone local. Have them clear your adaptive shifts in your tune and adjust the torque managment. Remember, you want some torque managment set in still and do not want to clear it 100% especially for the 2-3 shift. Having a transmission that breaks your neck when shifting isnt neccessary. You will break hard parts in a hurry. Good clean, crisp shifts is what we are after here. Now that you have everything apart you can start the assembly process. Get our your instructions start from the top. I have attached the instructions with a few little notes to go along with it. Tighten all VB bolts inside pan to roughly 8-10 ft lbs. Again be sure you get your bolts in the right holes!! When re-filling transmision with fluid, make sure truck is on level ground. Start by pouring in 4-5 quarts then check. Remember you still have fluid in the torque converter (if you did this in the truck) When you see fluid on the dipstick start the truck and get to operating temperature. While truck is warming up, check for any obvious leaks. Set the parking brake and put the transmission ins nuetral position. Then fill as needed.. Then put the truck in drive and make sure it engages all gears (D,3,2,1) and reverse. Road test. Monitor for transmission engaging all gears correctly and downshifts. Recheck for leaks after test. This might seem like a tall task to handle but it really isnt. Again if you are mechanically inclined you can do it. The best thing you can do is stay clean. Stay organized. (OCD is not a bad thing in this case). Double check your work, if anything triple check if it makes you feel better. If there is anything in this I might have missed (a tool, part, ect) please chime in and I will add it to the list. Im pretty sure I got everything. So when adding the fluid friction modifier should you fill to proper level then add or does it take the place of some of the ATF fluid? Pretty nice write up. I see on your list you have the force motor being turned up, I wouldn't recomend doing that as that will change the calibration for that. This is something you'll want to control in the tune. Nice work either way. I was going to say - be very careful adjusting the EPC screw, because a little adjustment goes a LONG ways, this screw is very sensitive. The job of this screw is to control main line pressure in the transmission, and a 1/4-turn of the EPC screw is A LOT, do not exceed this amount. In our transmission builds we do add 1/8th turn to the EPC screw, personally I would not go any more than that but certainly no more than 1/4-turn!!! I don't think it'll fit. But I'm not too sure. Check the search button when your on the home page and I'm sure you'll find something. I remember reading up on this a few times.